The new trend in setting sprays include adding SPF. SPF setting sprays protect your skin while keeping your makeup flawless. Sunscreen isn’t something you want to leave out of your skincare regimen. In the beginning I thought, “Why would I even need to have a setting spray with SPF?” but I realized that the sun does not discriminate! Incorporating SPF into your setting spray provides protection from harmful UV rays, sets your makeup and provides a cooling mist. Best of all, you have the chance to reapply your sunscreen every two hours. The options are limited for applying SPF after your makeup. You can either use a powder with SPF which can sometimes be cakey, not the right shade or streaky when applied. The other option is to take off your makeup and reapply your sunscreen which most people won’t do. 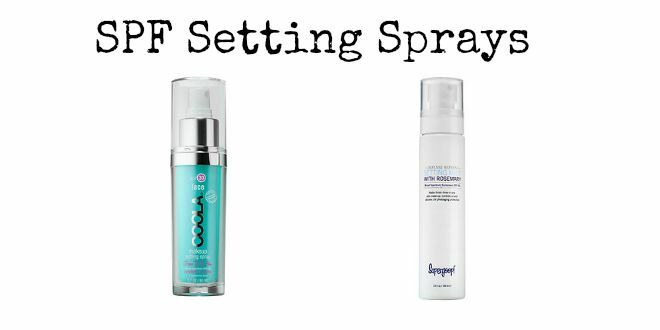 SPF setting sprays give you an easy way to reapply without the fuss. I came to the conclusion that both sprays can be used to protect the skin but set the makeup with different finishes. Coola’s makeup setting mist contains organic ingredients and is lightweight with a matte finish. The broad spectrum SPF 30 mist is infused with aloe vera and cucumber extract. At first it smells like pure alcohol but dissipates within seconds. 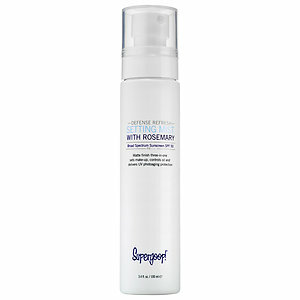 Supergoop’s formula includes rosemary and left my face with a refreshing minty scent. It helps control oil and shine with SPF 50, sets makeup and block UV rays. In my experience I felt between the two products “Coola” made my skin feel more matte. Although “Supergoop!” is said to leave a matte finish I found that my skin was left with a dewy glow. Both formulas are formulated without parabens or sulfates. Protecting the skin from the sun is a necessity and I feel the two products are huge game changers for all makeup users!